Many people in Western society are troubled by very high cholesterol levels. The typical Western diet is made up of foods that lead to this sort of health challenge. 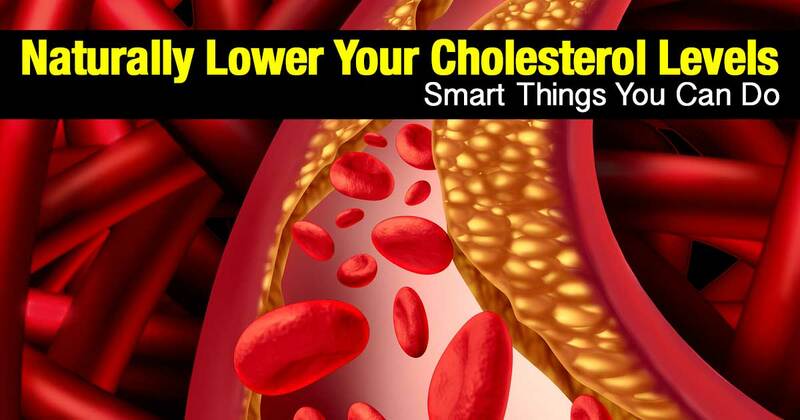 In this article, we will discuss several natural ways that you can reduce your cholesterol levels in a relatively short period of time. In fact, in as little as three months you could have your cholesterol level stabilized and enjoy a healthier life. Read on to learn more. One of the best things you can do to reduce your low-density lipoprotein (LDL) levels and increase your high-density lipoprotein (HDL) levels is to make healthy alterations to your diet. It’s important that you reduce or eliminate unhealthy foods and replace them with natural whole foods and super foods. One of the most important nutrients for overall good health and especially for helping you maintain healthy cholesterol levels is Omega-3 fatty acids. The best way to get these vital nutrients is to eat wild-caught fish. Salmon is the best, but other fish such as mackerel, tuna and codfish are also quite good for providing generous amounts of Omega-3 fatty acids. Other foods that contain these valuable nutrients include natural, organic grass fed beef, venison and lamb. Organic, free range eggs are also an excellent source of Omega-3 fatty acids. Healthy oils, such as flax seed oil, borage oil and evening primrose oil also contain Omega 3 fatty acids. It is also very important to eat a diet that is high in fiber. Add lots of berries to your everyday diet because they are very nutritious and full of fiber. Additionally, your diet should consist of at least half fresh fruits and vegetables. Some of the best are cruciferous vegetables and green leafy vegetables. Nuts and seeds also provide healthy oils and a good dose of fiber. Chia seeds and flax seeds are especially good additions to your diet because they provide both fiber and Omega-3 fatty acids. Ample fiber helps keep your digestive system running smoothly and your colon clean and well-toned. Additionally, having ample fiber in your diet supports the growth of healthy bacteria (i.e. probiotics) in your gut. This is extremely important to good health in general. Healthy oils are very important for any diet, and they are especially important if you are focusing on getting your cholesterol levels in balance. Extra-virgin olive oil (EVOO) is an excellent healthy oil that is filled with monounsaturated fatty acids, polyphenols and vitamin E. All of these help increase your HDL (good cholesterol) levels. Having healthy HDL levels helps you fight off the ravages of aging and enjoy greater longevity. You only need a couple of tablespoons of EVOO a day to reap these marvelous benefits. You can use it on salad or in any cool or slightly warm cooking application. Don’t use olive oil at high heat because this changes its chemical structure and causes it to become carcinogenic. Use coconut oil for high heat cooking. Herbs and spices have marvelous healing powers, and Rosemary, basil and turmeric are among the best. Inflammation is the cause of most disease (including high cholesterol levels) and turmeric has truly miraculous anti-inflammatory properties. Turmeric has been proven to lower inflammation throughout the body. It is known to be an excellent treatment for arthritis, cardiovascular difficulties and even cancer. By lowering inflammation throughout your cardiovascular system, you can reduce your cholesterol levels. There are lots of ways you can use turmeric in your everyday diet. It is a tasty, mild herb that is used generously in many Indian dishes. In fact, turmeric is the main ingredient in curry mixes. It’s easy to add it to almost any dish you prepare. For example, you can mix it in when you make hamburgers or meatloaf. You can create a seasoning mix of turmeric, rosemary and basil to sprinkle on meat, fish or fowl before cooking. Keep your shaker of spices on the table to season your salads, veggies and other foods. Adding all of these excellent foods to your diet will make a big difference, but you should also reduce or eliminate foods that increase your LDL levels by causing inflammation. For a long time, people thought that egg yolks caused increased LDL levels and should be avoided. Today, we know that this is not true. In fact, it’s a good idea to eat one or two natural, free range organic eggs every day to maintain healthy cholesterol levels. Just Say NO To Sugar! What really does cause inflammation is sugar. Sugar is ubiquitous in the modern Western diet. If you read labels, you will see that almost every type of packaged food lists some form of sugar as its first ingredient. It’s very important that you pay close attention to the things that you eat and avoid eating sugary processed foods. They really should be eliminated from your diet altogether. The modern Western diet also consists of a great deal of grain. Most of it comes in processed forms and converts into sugar in your system very rapidly. It’s very important that you reduce your intake of grains sharply. You should only consume whole grains such as brown rice, old-fashioned oatmeal and sprouted grains. They should make up no more than a quarter of your diet. Another product that is found in almost everything in the Western diet is hydrogenated oil. This is oil that has been highly processed at very high temperatures. This processing causes it to be carcinogenic. Just like sugar, hydrogenated oil is in almost every kind of processed food. Be sure to read labels carefully and consume only healthful, nutritious oils such as EVOO and coconut oil. Drink lots of fresh, pure filtered water to keep your system flushed and your body hydrated. Avoid alcohol which converts into sugar in your system almost immediately. You should also avoid consuming excessive amounts of caffeine because it tends to jangle your nerves and will also cause you to become dehydrated. High quality nutritional supplements can help you stabilize your cholesterol levels. Always be sure to go with a well-established, high quality brand of supplements. Low-quality supplements can actually do more harm than good. You should always take a well-balanced multi-vitamin. Additionally, there are a couple of supplements you should take specifically for cholesterol reduction. 1. Fish Oil: First and foremost in fighting high cholesterol is cod liver oil or fish oil, which provides a reliable dose of Omega-3 fatty acids. Take 1000 mg daily. 2. Coenzyme Q 10: If you are taking medication (e.g. statin drugs) to lower your cholesterol levels, you must be sure to take coenzyme Q 10. Naturally, you will want to clear this with your doctor first; however, generally speaking 200 mg of CoQ10 daily can be extremely beneficial for balancing your cholesterol levels. Get Up & Move Around! In addition to a healthy diet and proper supplementation, you should also get at least an hour of exercise every week. Don’t do this all at once! Instead, strive to exercise for 15 or 20 minutes every day. You don’t have to exercise to exhaustion or hurt yourself in any way. You can walk, cycle, do yoga, play sports, swim or engage in any kind of exercise that you enjoy. If you prefer a more formal training regimen, you may like the “Burst Fit” training program offered by Dr. Axe. This program is devised especially to help people who are working to lower their cholesterol levels quickly. Following a regular schedule of light to moderate exercise every day can produce significant results in under a month. Taking a relaxing, detox bath in the evening is a great way to reduce your stress levels, detoxify your body and enjoy a great night’s sleep. At least three nights a week, you should indulge in a 20 minute soak with a cup of Epsom salts and 20 drops of lavender essential oil. Epsom salt contains magnesium, which is helpful in lowering cholesterol levels. Lavender oil is very relaxing and has actually been shown to lower cortisol (the stress hormone) levels. It’s a good idea to avoid stress as much as possible in your life. Structure your day in such a way that you don’t have to rush about or feel pressured. For example, in the morning give yourself a little time to do some reading and/or do a little meditation, prayer or just take some time to think. If you are able to walk or bicycle to work, do so. This is a great way to avoid the stress of traffic and get a little exercise. Take short walking breaks throughout the day to help keep yourself calm and relaxed. Balancing your cholesterol levels really just consists of taking good care of yourself. When you eat a healthy, balanced, whole foods diet, drink plenty of water, exercise regularly and reduce your stress levels, you will improve your overall health. Follow the smart ideas presented here, and you are sure to see marked improvements in your cholesterol reading within one-to-three months.